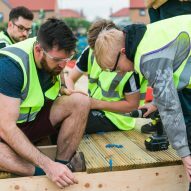 Architectural educationalists Matt+Fiona worked with school pupils in the city of Hull to design and build a classroom with pivoting walls on their allotment. 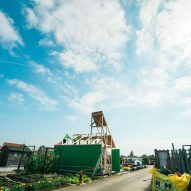 The green timber pavilion was created as part of the Made in Oakfield project, which was devised by architect Matthew Springett and educator Fiona MacDonald. 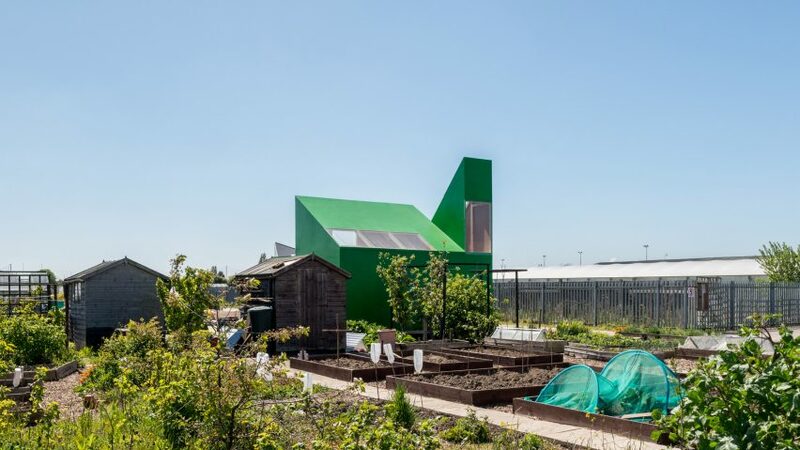 It allowed pupils aged between 11 and 16 from Oakfield Residential School – which caters for pupils struggling in mainstream education – to design and then build a learning space for the school's allotment in just seven days. 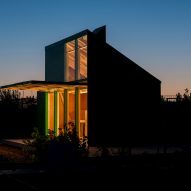 "Self-build education projects empower young people to realise they can not only be involved in the decision-making that shapes our cities, but literally create places within them," MacDonald told Dezeen. "This is particularly important for young people at a school such as Oakfield," she added. "It caters for students who have not managed in mainstream education and require a specialist educational provision to meet their complex social, emotional and mental health needs in order for them to succeed." The design was developed in an open workshop, during which students explored ideas through model making. A clear demand emerged for a structure that could serve as both an open learning space and an enclosed 'snug'. The children also wanted a high-level lookout so they could survey the allotment. Matt+Fiona worked to incorporate these ideas into a design that could be feasibly be built in just a week by a team of pupils and volunteers. 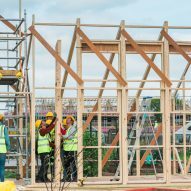 "Just one week to build a five-metre-tall building with no prefabrication and a young, mostly amateur workforce was a little ambitious!" said MacDonald. 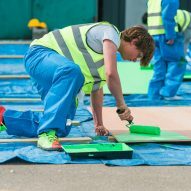 "But there was an incredible camaraderie throughout, with half of the school's teachers turning out on the final evening to help ensure it was finished on time." The final shed-like building has a mono-pitch roof with four large pivoting counter-weighted doors. These can be locked at night but when open, provide a canopy for the deck outside. At one end of the building stands a lookout tower, also with a mono-pitch roof, that faces in the opposite direction. 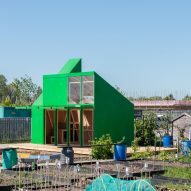 The plywood shelter has a green rubberised paint skin that provided a waterproof shell with simple and fast application. The Oakfield team also have plans to install solar panels and rainwater harvesting now the building is complete. Ste Sunners, the teacher at Oakfield School leading on the project, said it has had a big impact on the students involved. "The pupils at Oakfield have had a huge amount of enjoyment and enrichment from the big build," Sunners told Dezeen. "We have seen their confidence, self-esteem and enthusiasm for horticulture grow as a result." 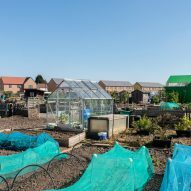 Made in Oakfield is part of the No Limits initiative – the educational strand of Hull's UK City of Culture programme – and is located on an allotment in Portobello Street, east Hull. It was given to the school by the council six months ago as a place for pupils to take a break from the school environment through gardening. Other recently completed projects at schools in the UK include Asif Khan's elevated wooden play area for a east London primary school and a dining room with a rainbow-coloured facade for a Buckinghamshire school. Photography is by French+Tye, unless stated otherwise.